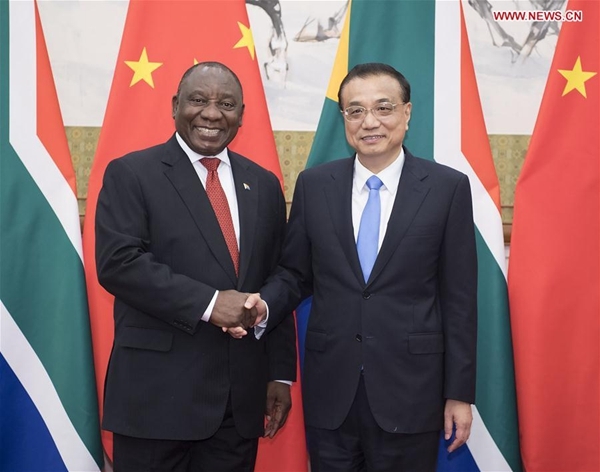 Chinese Premier Li Keqiang on Sunday met with South African President Cyril Ramaphosa ahead of the 2018 Beijing Summit of the Forum on China-Africa Cooperation. Li said China is willing to deepen bilateral cooperation with South Africa in various fields including industry, equipment manufacturing, investment, and marine economy and will encourage more Chinese enterprises to carry out localized cooperation in South Africa. He also called for expanding cooperation on special economic zones and industrial parks as well as expansion of bilateral trade volume. Ramaphosa said South Africa hopes to strengthen the bilateral and multilateral cooperation with China in various areas, enhance the construction of multilateral mechanism, expand the South-South cooperation and safeguard the multilateralism with the United Nations and the World Trade Organization at the core.